"This pie is actually better the second day. So the best plan would be to make it the day before you need it, and let it sit in the refrigerator overnight." Knead together the pie dough and the 1/4 cup finely chopped pecans. Line 9-inch pie pan with the pecan dough; fill with heavy-duty foil and dried beans or pie weights. Bake for 20 minutes or until set and lightly browned (see Editor's Note). Let cool. Beat cream cheese and confectioners' sugar until smooth, and spread in the pie shell. Prepare chocolate pudding according to package instructions, but use 1/2 cup less milk. Set aside. Whip the cream with 1/2 cup sugar. Spread half of the whipped cream over the cream cheese in the shell. 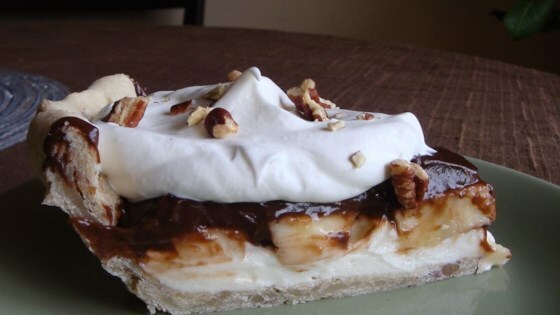 Lay sliced bananas on top of the whipped cream, and cover with the chocolate pie filling. Spread the other half of the whipped cream over the bananas. Sprinkle with chopped pecans, and refrigerate at least 3 hours or overnight before serving. Get tips on blind-baking your pastry in our How To Pre-Bake A Pie Crust article. This is SO good I can't believe it doesn't have more ratings. Don't let all the 'steps' fool ya- it's really easy to make & it is wonderful!!! Yummy! Definately let it sit overnight. It really comes together on the 2nd day. What a delicous dessert. It was a very good blend of flavors and it hit the spot on a hot day. This is REALLY rich but it is so yummy. A big hit! Thanks for sharing.